The guys at LMB take a break from depicting fauna and attack flora in this one. Maybe the designer was eating corn off the cob and thought, "Hey, this would make a great idea for a random LMB ad!". Or maybe he was tired of elongating animals all the time, he figured fitting all the states on a corn would be much simpler. 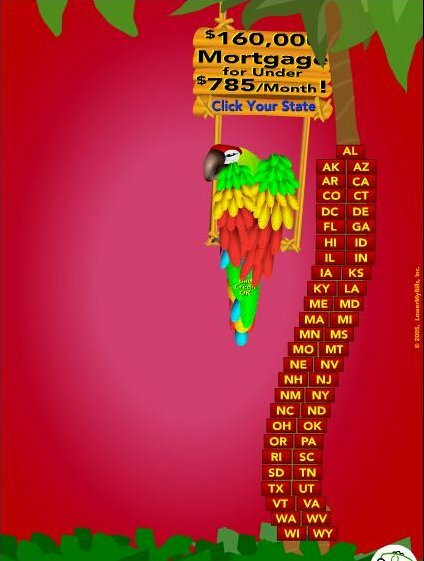 The designer makes full use of Flash in this ad, and makes corn fly off in a swirl when you mouseover. You see, it's not normal corn that pops; it's quantum corn. Presenting a welcome change from the 'elongated animal' category. This parakeet from the tropics seems to be entirely dressed with deflated balloons instead of feathers. Aware of her somewhat lacking attire, Polly turns her head and looks back in shame, and beseeches us to please Click Our State. A couple of weeks ago, I saw the sequel to 'The Ring'. The follow-up to the scariest movie of the last 5 years was a laugh-a-thon, with horror cliches that screamed 'sequelitis'. You could tell the movie was a total dud by the fact that the scariest scene in the movie involved deer and roadkill. The eyes of the haunted deer in the movie closely resemble those of the one seen here. Maybe they are long-lost brothers; the really scary one moving to hollywood to score juicy film roles, while the dumb but handsome one stayed back and started on a modeling career -- which has been on a downward spiral ever since.